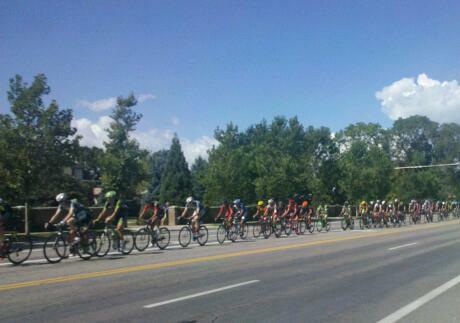 The Tour of Utah Bike Race is moving through Salt Lake. I’ve experienced it in two ways so far. 1) Yesterday trying to get home from work, I sat in traffic as the organizers prepared downtown for the bikes to pass through. The signs and markers had all indicated the closures would be from 4-7PM. I left work early at 3:15 only to be stuck within premature closures. I wasn’t exactly pleased but really what did it matter? The placed buzzed with activity and I was a tad sorry I couldn’t participate. 2) Today, I unofficially helped control some traffic to let the bikers roll back out of town. It was fun to watch the group roll through. The gears of their bikes churned together like a single machine, sounding like a hard rain pounding down on pavement. It was an experience and sight to behold; I highly recommend experiencing it yourself one day. Yet, one car and one lady in particular became very displeased with our efforts to stop her progress. Not that the cops, who really had control of the road, wouldn’t have ruined her day if she made it past us, she sure thought we had done it. She huffed in disgust at the thought of other human beings interfering with her day and her life. The bikes all passed within 10 minutes and she left but not without condemning glares. I thought of my reaction yesterday. My progress was blocked and my time was wasted on behalf of others’ event. I’m proud of me to have just let it go and enjoy the activity around me, to let it inspire me to want to be part of it today, to share in the fun. It’s better this way, and my life, as it turned out, wasn’t ruined.